You can scour the internet for references and advice on desensitizing your horse. 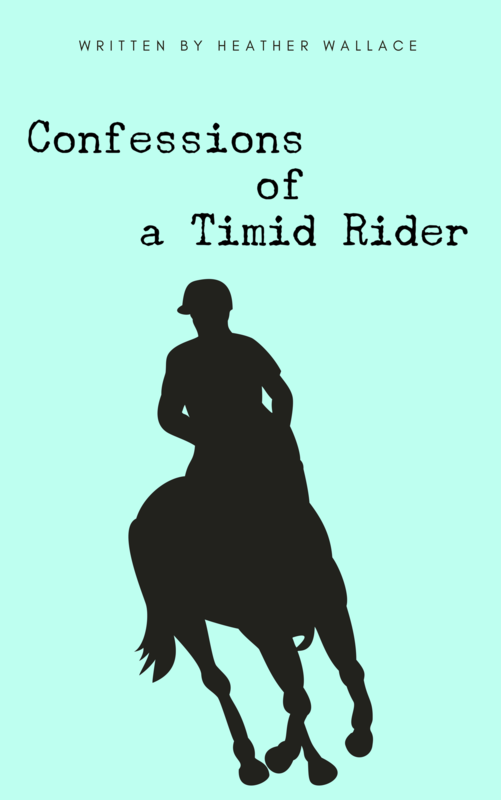 But what happens when it is the rider that needs desensitizing? Every ride is a learning experience for both horse and equestrian. Some days are good, others could use improvement. Recently I had a lesson with my trainer after a long summer off due to pony camp and my children’s schedules. Until then we were mostly hacking around the barn and taking easy trail rides because of campers dominating the schooling rings. Thus, a lesson was much needed for both of us. Lessons are necessary for all levels. Having a training plan and another set of eyes on the ground is priceless. Because I am a visual person, I tend to do well with semi-private or group lessons so I can see others as my trainer calls out advice. It helps me to incorporate the same on my own. Further, lessons correct mistakes that I make inadvertently on my own. Practice Makes Perfect, or at Least, Better. Until I bought Ferrous, I was riding once per week, sometimes twice, if the opportunity arose. There was little time to practice what I had learned and no real room for improvement. It was frustrating at best. While I may not be the best rider, my confidence has at least improved in the months since, and I’ve learned valuable lessons. The frequency of rides builds my confidence because, for every one tough ride, we have many more amazing ones. Where at the beginning of summer I never would have considered riding into the woods alone even on barn property, I am now venturing solo a short distance to mine and Ferrous’s pleasure. More, jumping crossrails no longer fills me with dread, but is something I will practice now on my own. I surprised even myself when I saw a fun little course set up from an earlier lesson and decided to trot and even canter a few on my own. Successfully, I might add. I would never have attempted these things even six months ago. I believe in the Rule of Three. While this can refer to writing, karma, or science, I have experience of my own with animals. Often dogs receiving massage for the first time take three sessions to settle in and relax fully, my having earned their trust during that time that I will make them feel better. Ferrous is very quiet but does get spooky on occasion, like when the fly curtain fell in the ring and looked different than usual. Any change at home is scary, right? The first time we attempted to walk past he balked and tried to turn around. With a strong leg and rein, we moved forward slowly but surely with a big pat when he did what was asked. Two more times we did this together while each time he reacted less and became more curious. Three times in practice. On the fourth pass around he behaved like it was not even there. The same can be said for me. When my trainer and I are working on something, my best attempt is usually the third or try. While my pony is quite amazing, he does have a few foibles, one of them being he hates puddles. I’ve managed to desensitize him to them on the ground, but while astride he will dodge or, when pressed, even jump them to avoid them. The rain was pouring down outside the ring, coming in through the opened panes and created a little, itty bitty puddle in one area. We worked on trot – canter transitions with ground poles and on the first round, my pony dodged the tiny puddle and took the ground pole long, rather than cantering over it nicely. I was surprised and called out a half laugh/ half exclamation. I was scared, I was just surprised. However, by voicing it out loud as I did I made it a bigger deal then it had to be. Something my trainer noticed indeed. That was the only time he dodged and the only time I exclaimed, but she was right. It is usually better to react less as the rider. Keep moving forward, ignore the bad, and expect the good. I didn’t want to inadvertently support his behavior and encourage him to do it again. Farther into my lesson, things became a little more exciting. We were sharing the Kentucky-style indoor with another lesson horse. Generally, this horse had terrible tacking manners but was impeccable under saddle. He and my horse do not go out together but as both were lesson horses there, I had assumed had met at one time or another. Ferrous and I were trotting on the long side of the ring, about to canter at the corner on the outside track when suddenly the other horse (on the inside), turned to attack Ferrous with a kick. Ferrous is mild-mannered but does stick up for himself if required, was having none of it. He tried to back off and confront his would-be attacker. Instead, I immediately got his attention back and moved him forward away from the horse. We chose to pretend it never happened, but later while cantering the other horse came up behind us and tried to chase us down and bite Ferrous for some imaginary slight. Totally out of character for that horse, but to Ferrous’s credit he only pinned his ears and let me take control of the situation. That situation was incredibly dangerous and I was proud of how I handled it. More, my trainer told me I did the right thing. Working with horses, you should expect the unexpected and “less is more”. I didn’t panic. I didn’t cry. I didn’t even shake. I handled the situation and I moved on. In all fairness, this would not have been the case a year ago. But in riding regularly, and dealing with different situations that occur, I find myself largely desensitized to many occurrences. Am I still a work in progress? Absolutely. What would you like to desensitize yourself too?